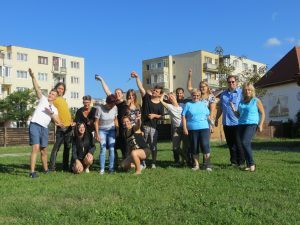 From the 22nd to the 26th of August 2016 the teachers and youth workers from Fundatia Crestina Diakonia Filiala Sfantu Gheorghe, GAIA and Sukromna Zakladna Skola, who would later implement Head in the Clouds directly with the children and youth were invited to Sfantu Gheorghe, Romania. 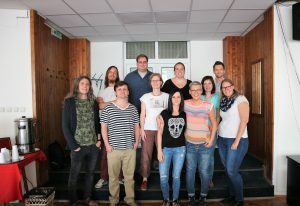 There they were trained by members of the Technical University of Kosice, the Technical University of Vienna, Verein Offenes Lernen, SCIO and GAIA. First they were made familiar with the project, the educational approach, their roles and the partners. 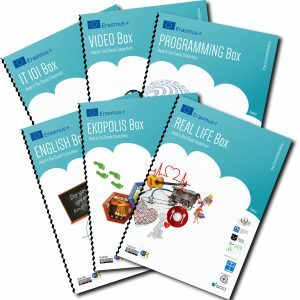 Then throughout the week they learned about the educational boxes in detail by completing tasks themselves, tried filming for the documentary and received instructions for it’s production, were explained the process of evaluation, and were explained the process of documentation through the handin-application. Furthermore, the team took the chance to ask feedback from the teachers and youth workers. Some open questions, like the future channels of communication, were agreed upon together. 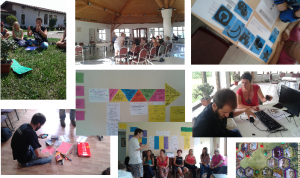 On the second day some tasks were tried with the children the Fundatia Crestina Diakonia Filiala Sfantu Gheorghe works with, and on the 25th local stakeholders (school directors, politicians, media, teachers, parents etc.) were invited for a presentation of Head in the Clouds, which included a chance for them to try some of the tasks the children would experience. Another training took place in april 2018, to share the educational approach that Head in the Clouds developed with further educators. In this event the educators were trained in the educational approach developed and implemented during Head in the Clouds. All participants were trained in the evaluation and documentation of learning, and the final versions of the boxes were presented and trained. Additionally, the training gave a chance for those who had implemented to share with each other and the newcomers their experiences. For these exchanges and the training itself the trainers used the methods of the project itself and the approach of non-formal education. The fist Multiplier Event took place during this week.